oldest son, John E. was not quite sixteen. Seven additional children ages three to fourteen were at home; and, recall that their youngest daughter, Julia, had died just five months earlier. Moreover, Ellen was about four months pregnant with Peter, their last child, who was born October 14, 1873. I can only imagine that it was a difficult pregnancy to say the least. age 36, died of cancer. (See death register for Ellen, left.4) By this time, John E., the oldest son, was twenty. The eldest daughter, Mary Ann was married to Timothy Murane5 and living in her own household; but, there were still seven under age children left at home. There are no details of what happened to John and Ellen’s family after John’s death. The estate was not filed until after Ellen’s death. Documents in the probate file do give some information. The David Brown letter states that, “I don’t believe that these people lived in Delaware as did Patrick Brown and family. The only place of their residence, to my knowledge, was on what we formerly knew as ‘Dublin Road’ . . . “ There are a couple of documents in the probate record that support this theory. 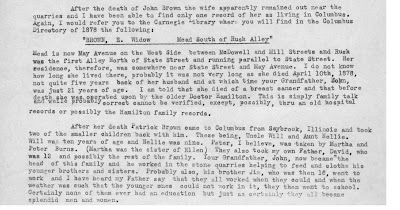 The Will of Martha Burns Brown Hogan, Ellen’s sister and wife of Peter Burns, left the quarry property to her nephew, John E. Brown.7 The description of the property in the will says “houses” (plural) suggesting that John and Ellen did, indeed, live on the quarry property with Peter and Martha Burns. 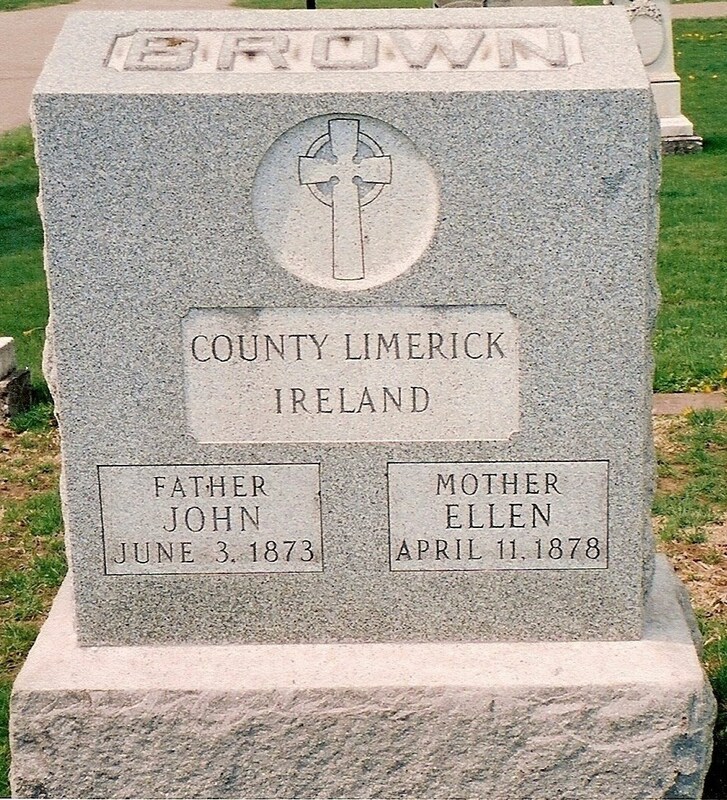 As indicated in the last post, John and Ellen Brown owned two city lots. Since there were outstanding bills, the Probate Court ordered that the real estate be sold to settle debts. The major bills appeared to be the blacksmith bill shown above, the mortgage for the city lots held by Thomas Bergin, (see details in the last post) and a bill from the undertaker, Patrick Egan, for the 1873 burials of John Brown and his daughter, Julia.13 (See below) On April 22, 1878, an estate file was established for John Brown. On April 16, 1878, a bond was posted by Patrick Egan to be named Administrator of the estate. 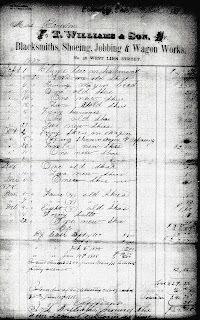 expenses, (the city lots were sold at auction on May 17, 1879 for $365.00 to Thomas Bergin), Mr. Egan did collect his fee for the 1873 burials. There was another bill for Ellen’s funeral (see above) which does not seem to be included in the final accounting.14 (See Administrator's Account right.) It appears that Mr. Egan was trying to retain as much cash as he could for the family. probate records. On April 23, 1878, Patrick signed a note stating he had served notice to all of the children of John and Ellen Brown that there had been a claim filed against the real estate.15 (See copy left) The note was notarized by Martin Nolan, an attorney practicing in Columbus, Ohio. estate had been sold.16 (See copy right) The notice was notarized by Richard E Moreland, a neighbor of Patrick’s in McLean County, Illinois. That is where we will go for the next part of the story. One final thought, (plea) before I end this blog. Many years ago, (2004) a family tree that included this specific Brown family was posted on RootsWeb – long since taken down – that stated, “Ruth has picture of Ellen Burns.” The note further states that the photo was, “dated April 13, 1818 or that was Ellen’s birthdate?? ?or date of death?” I have a theory that the ink was faded on the back of the photo and that the date was written April 13, 1878 – the actual date of Ellen’s death. (The "7" had faded to look like a "1"?) Perhaps "Ruth" is a descendant of Thomas, fifth child of John and Ellen? If anyone knows of the photo, I would love to see a copy! 1. 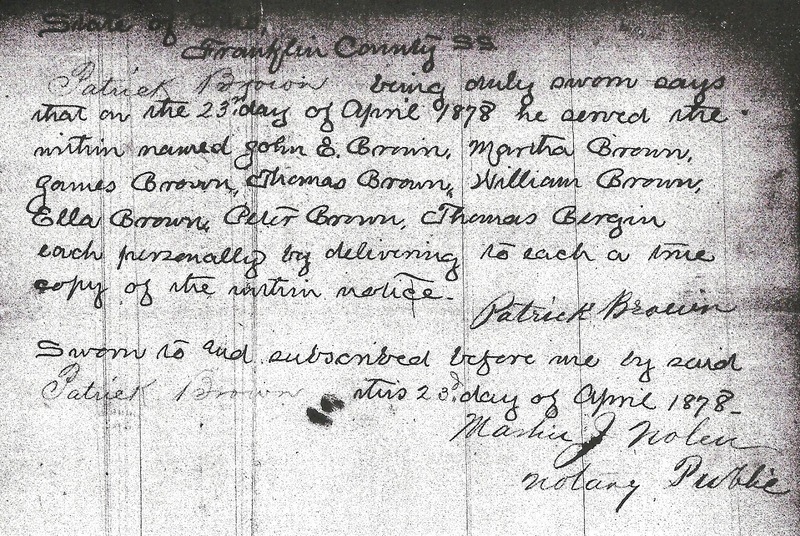 “Ohio County Death Records, 1840-2001,” database with images, FamilySearch (https://familysearch.org/ark:/61903?1:1:F6JV-1PY : 13 December 2014), John Brown 03 Jan 1873; citing Death, Franklin Township, Franklin, Ohio, United States, source ID v1 p71, County courthouses, Ohio: FHL microfilm 285,206. The record shows the date of death as January 3, 1873. The correct date of death is June 3, 1873. 2. I did contact the Franklin Coroner’s Office. They do not have files from that early time frame, and, there does not appear to be files at the Ohio Historical Society. 3. Brown, David, Kewanee, Il, 11 May 1943, Letter to Esther _________, Columbus, OH. 4. 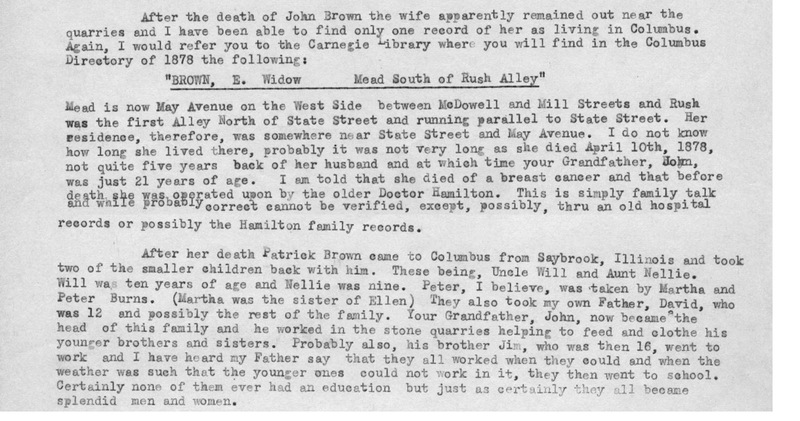 “Ohio, County Death Records, 1840-2001,” database with images, FamilySearch (https://familysearch.org/ark:/61903/1:1:F6JK-5M9: 13 Dec 2014), Ellen Brown, 11 Apr 1878: citing Death, Columbus, Franklin, Ohio, Unites States, source ID v1 p 125, County courthouses, Ohio: FHL microfilm 285,206. 6. Information from Catholic Cemeteries, Columbus, Ohio. Few early records for the cemetery were kept. Information is from a ledger available at the office of St. Joseph Cemetery, Lockbourne, Ohio. Remember that twelve graves were purchased by Mrs. John Brown on January 22, 1873 for $35.00. Cemetery records show burials for the Brown family in graves numbered one through six. Graves seven and eight do not show burials. Graves nine through twelve show burials for a Vogt-Tyler family. There is no indication in the cemetery records that these graves were sold by the Brown family and I do not know of any relation to this family. The earliest burial is for Edmond Vogt in 1935. 8. Franklin County, Ohio probate case files, estate no. 010060, John Brown (1878), bill of J.T. Williams & Son, 17 Jun 1878, Probate Court, Ohio Historical Society, Columbus, Ohio. Note: The bill does not state whether the horses were shod at the Williams’ establishment or whether the shoes were purchased and put on by one of the Brown-Burns family at the quarry. 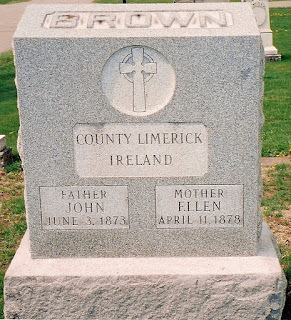 Remember, there was a Brown that was a blacksmith in the Patrickswell area in County Limerick and someone from the family in America may have developed that skill. 9. Having owned horses myself for many years, I do have some experience with blacksmiths and horse shoeing. While horse shoes are custom fit, if not custom made, as a rule after the horse matures, the size of a horse’s hoof does not change over the years. In general, metal horse shoes last many years. 10. 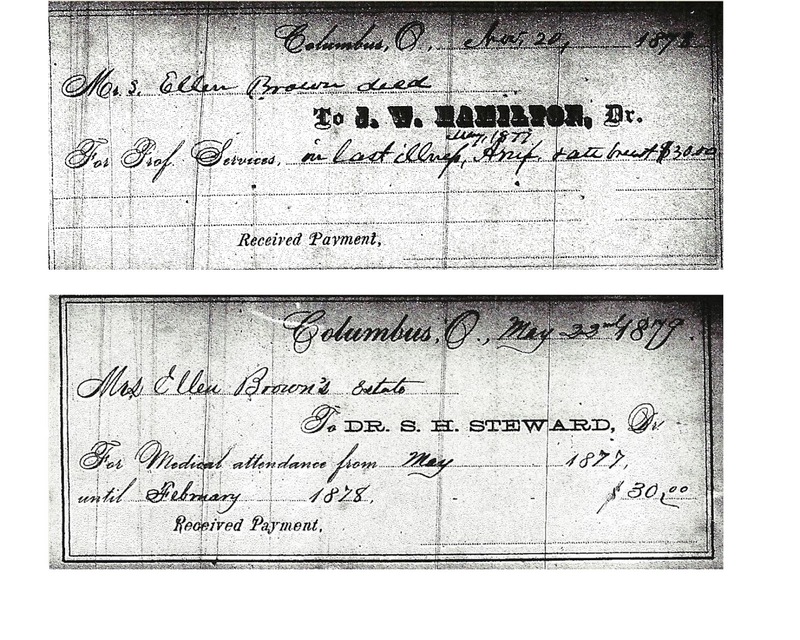 The 1877 directory shows Mrs. Ellen Brown as a resident on the east side of Mead north of State Street. The 1878 directory shows the widow E Brown on Mead south of Rush Allen. Mead Alley is now May Street. While the property is now vacant, this house was located in what is now called “the bottoms” of Columbus just west of downtown and the Scioto River. It would have been in Franklinton, the earliest settlement in Franklin County. 13. Franklin County, Ohio probate case files, estate no. 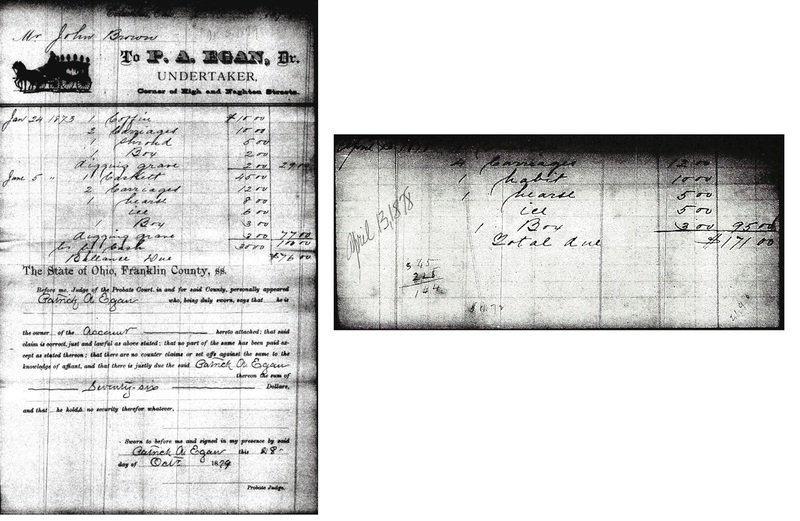 010060, John Brown (1878), Bills from Patrick A. Egan, undertaker. The top portion of the bill for Ellen, dated April 13, 1878, is not legible. Since the total sum due for this occurrence was $95.00, the top line would be for $60.00. If this bill follows the structure of the previous bill, the first line would show the cost of the casket. 14. Franklin County, Ohio probate case files, estate no. 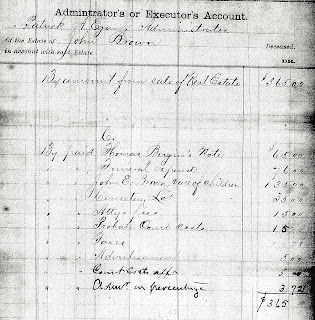 010060, John Brown (1878), Administrator’s or Executor’s Account, not dated, Probate Court, Ohio Historical Society, Columbus, Ohio. There appear to be a couple of omissions from the accounting, notably the blacksmith bill (J.T. 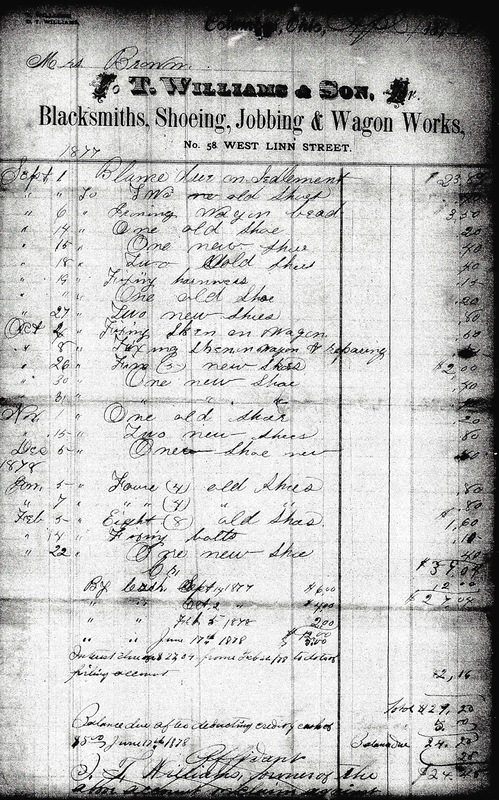 Williams & Sons), and Patrick Egan’s bill for Ellen’s funeral expenses. Also note the $35.00 payment for the cemetery lots in Mt. Calvary from 1873. Additionally, the original mortgage on the city lots was for $235.00. Payment on the note to settle the estate was for $65.00; so, some earlier payment(s) must have been made on the mortgage. 15. Franklin County, Ohio probate case files, estate no. 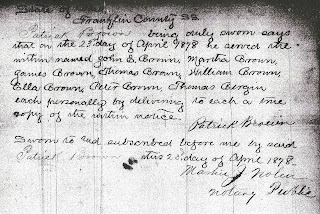 010060, John Brown (1878), Notice to John E Brown and others, 23 Apr 1878, Probate Court, Ohio Historical Society, Columbus, Ohio. 16. Franklin County, Ohio probate case files, estate no. 010060, John Brown (1878), Notice to William Brown, 18 Nov 1879, Probate Court, Ohio Historical Society, Columbus, Ohio.